Today, we commemorate the millions of victims of Nazi persecution. We solemnly reflect on the massacre of nearly one third of the Jewish people and countless other minorities. We gather here today, united by a common responsibility, to never allow those who suffered atrocious acts of discrimination, deprivation, cruelty, and murder, fade in vain with the sands of time. To this end, Holocaust education has provided us with an exemplary model of how humanity can unite to honour the victims of persecution, and give them a permanent place in our collective memory. 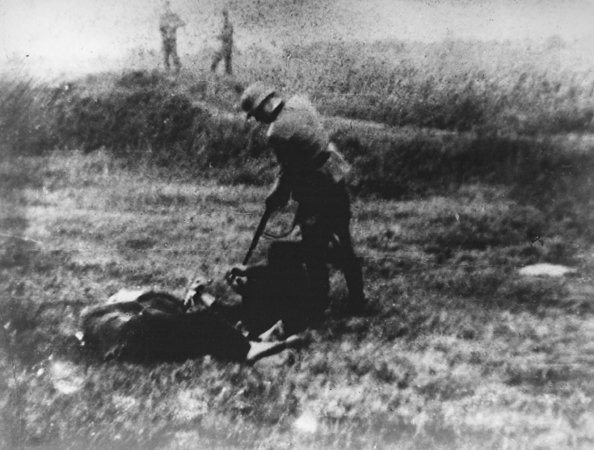 A German soldier points his rifle at a prisoner lying on the ground in the village Jajinci. The village of Jajinci near Belgrade served as an execution site for inmates from the Banjica concentration camp. According to Dr. Philip J. Cohen, the camp was primarily staffed by Serbian guards who participated in the killings of Jews. It is the responsibility of our generation, and every generation to come, to study and examine why the world failed to prevent the Holocaust. Let us educate ourselves and our future generations to fight anti-Semitism, hatred, intolerance… injustice! The genocide committed against Bosniaks in Bosnia and Herzegovina at the end of the 20th century is still a fresh wound! The massacre of these people was carried out in pursuit of the ultra-nationalist projects of “greater” Serbia and “greater” Croatia, with the genocidal intent to eradicate Bosniaks as an ethnic and religious group, aiming to “resolve the Muslim question” in the Balkans. As we recall, it was not so long ago that another fascist state aimed to “resolve the Jewish question” in Europe. So I ask you, just as the generations before me have asked: when will we stop massacring ourselves? When will we learn that ethnic and religious identity is not a crime? When will we stop debasing our common humanity? Although Bosnia and Herzegovina serves as a symbol for all those suffering because of ethnic and religious identity, it is also a beacon of light for all those willing to stand up to injustice. Bosnia and Herzegovina today still stands as a proud example of a paradigm of antifascist resistance and resilience to the worst evil known by mankind – genocide. All this in spite of the shameful fecklessness shown by Europe and other Western nations, which spoke of fighting injustice, constantly repeated “Never Again” as a slogan, yet, they stood by and allowed to unfold one of the bloodiest and most brutal tragedies in recent memory… and all this in the heart of Europe at the end of the 20th century. The civilized world remained silent and deaf to helpless people and their cries for salvation… Again I ask you: is this the example we wish to set for future generations? By studying international law and by insisting on its enforcement, in particular, the laws against genocide and other forms of crimes against humanity, we implicitly raise our voices against the Holocaust, genocide, and all forms of injustice wherever it may be manifested. We raise our voices to combat Holocaust denial and speak out in the face of bigotry and hatred. We raise our voices to uphold the standards and ideals of the United Nations. We raise our voices to fight impunity for genocide, war crimes and crimes against humanity. We raise our voices because our world today continues to be plagued by ruthless violence, utter disregard for human rights, and the targeting of people solely for who they are. We raise our voices today and we send our message loud and clear: we will incessantly fight to preserve the most sacred of human values, human freedoms, human rights, and lives of the small, weak and helpless groups, human societies and peoples everywhere, regardless of creed, ethnicity, or gender. We will do this because of the sacred bonds that bind us as brothers and sisters in humanity. We will do this because we have a responsibility to all those whom we honour today, to take heed of history’s lessons and strive for a nobler society where respect and dignity for human lives is not just lip service. And we will do this because we believe that humanity will cease to exist the moment there is no one to fight for it. Let us unite today under the banner of humanity, let us unify under the flag of justice, let us embrace our fellow brother and sister in humanity, whatever national, ethnic, racial, religious, ideological, or political affiliation they may have, and let us collectively work toward a strategy of prevention and punishment for crimes against humanity.